Out of the darkness emerged a young boy who made his way down a dusty path strewn with carved pumpkins, his little painted nose ruffled slightly from the smell of fertilizer lingering in the air. He looked up towards a monstrous tent and grinned seeing the name painted onto a weathered wooden board. “Morgana’s Mystifying Circus,” he whispered under his breath before buttoning up the top button on his shirt. It was Halloween and he was given a special ticket to come and enjoy the show, he just hoped his father did not go back into his bedroom to check on him after tucking him in. The worse for wear tent had seen better days, tears in the top of it allowed some light from inside to escape into the darkness. Black Mountain had many attractions, but this was one the boy was eager to see, so eager that he came alone. His little brown shoes became dusty as he walked towards the tent door; he licked his hand and glided it over his hair to smooth out any strays, before walking through the canvass entrance. The dimly lit arena was filled with people, his shoes sinking slightly into the moist earth beneath him as he made his way past numerous wooden chairs. An overweight garish woman looked down at the boy and smiled, “you look like porcelain,” she slurred reaching forward to touch his face. The young boy stepped back and walked on, “where are your parents?” she called back after him, but he ignored her and found himself a front row seat. The boy watched as a masked woman approached him, she opened her right palm and tapped it with her left index finger. He reached into his pocket and pulled out a ticket, she smiled showing off her brown stained teeth. He placed the ticket in her hand, noticing the burn marks on her wrist. She tore the golden ticket in half and grinned before handing him half of it back. The woman pushed back her long black tresses before walking off into the back of the tent. He was amused with her costume, the burns looked so real and her teeth seemed if they were really rotting. The first act had finished, and the knife thrower was busy leaving the stage. Murmurs circulated in the busy tent before the crowd began to settle in their seats, a spot light appeared on the rickety stage. “Welcome!” a voice boomed from beyond an ivory-coloured curtain. “Welcome to Morgana’s Mystifying Circus.” From behind the curtain appeared a ringmaster; he flipped his velvet cape backwards grandiosely, striking his whip down strutting proudly as a peacock on the stage. The audience jumped and cheered every time he cracked his whip, the boy sat still and watched eagerly. “What do we have here?” The ringmaster asked pointing towards the boy, “a fan of Pierrot” he mocked looking at the boy’s amateur clown makeup. The boy grinned slightly revealing a missing front tooth. The ringmaster adjusted his bowtie before pacing back and forth. “Halloween is the only time of the year the dead walk among us,” he continued flipping his cape while strutting to-and-fro. “But for those that live on Black Mountain, we know that is not the truth,” he teased to which the crowd became loud, they clapped and laughed, chugging back beer and smoking cigarettes. “Be quiet now!” He commanded, “let me introduce you to my latest find.” The ringmaster kicked one of the throwing knives left behind from the previous act to the side clapping his hands. “Let’s bring out a wondrous beast,” the ringmaster proclaimed. “Calypso!” he shouted cracking his whip. “I give you Calypso, the dancing bear.” From behind the curtain came a monster of a beast, the bear stood tall and the audience gasped; around her neck was a chain which the ringmaster began to yank. The bear moaned, and the audience chuckled, the ringmaster struck her across the back. “Dance!” he instructed, but the bear would not listen. The audience turned their laughter to the ringmaster who became agitated. “Dance, bear!” He threatened, lifting the whip once again to strike, but he was interrupted by a clown walking onto the stage. He was carrying a great big carved pumpkin, he stumbled and fell over his own big feet squashing the pumpkin. The crowd laughed and cheered. The boy rested his hands on his knees and smiled while the clown picked the pumpkin pieces off his face. “Pernicious the Clown ladies and gentlemen!” the ringmaster announced through gritted teeth. Pernicious looked at the bear and danced. The more he tried to get the bear to follow his movement the more the audience laughed, but Calypso would not dance. The laughter from the audience quickly turned to shouting and moaning to get off the stage. “Let’s choose someone from the audience,” the ringmaster declared becoming embarrassed that his magnificent act had become a magnificent flop. He pointed towards the boy, but the boy shook his head. “What about you?” He asked a blonde girl no older than seven. She giggled and looked up at her intoxicated mother who nodded approving the request; she rushed up onto the stage, she straightened out the white ruffles on her polka dot dress before waving at the clown. Pernicious waved back and winked at the round faced little girl, to which the audience laughed once again. “She won’t bite,” the ringmaster assured the little girl leading her towards Calypso; he looked the bear in her eyes, his anger towards the rebellious beast enraged him. “What is your name?” He asked the shy girl, “I’m Mallory,” she answered swaying nervously holding onto her blonde pigtails. “Have a dance with Calypso,” he insisted pushing the girl towards the bear. She looked up at the bear which immediately stood upright, dimples formed in her cheeks as she smiled at the bear. Pernicious began to point at various people in the audience and waved goodbye to them, he then looked at the ringmaster and waved his index finger at him. The little boy watched eagerly; Pernicious clapped his hands, the stage lights went out and all that could be heard was the sound of chomping and cracking of bone. The sound of Calypso’s roaring could be heard before screams filled the decrepit circus tent. The stage light came back on; a maniacal laugh came from the clown as he threw his head back dramatically, exposing what looked like a severed tongue from his gaping mouth and a set of sharp teeth. He watched eagerly whilst his grisly companion pinned down the little girl, sinking its canines over half her head and neck it ripped a chunk of her face out exposing part of her skull. Pernicious revelled in great delight and clapped his hands while the bear shook her lifeless body in its mouth. The clown danced up to his bear and yanked a blonde ponytail out from its teeth, the smell of fresh blood stirred in the air, Pernicious lay the blood-soaked hair against his silvery mop and pirouetted around his ursine companion. The bear growled at her master before twirling around, she groaned as the clown grabbed her paws and began dancing with her. He was Pernicious the Clown, and he was glorious, he would split your sides laughing and then sew you back together himself. Pernicious cartwheeled towards the ringmaster cowering in the corner, he grinned showing his yellow decaying teeth before picking up the ringmaster’s whip. Pernicious looked at Calypso and winked, a mischievous smile appeared across his leathery face. He turned to the ringmaster, who shaking uncontrollably begged: “Please,” he said, kneeling before the clown. Pernicious frowned, and struck the whip across the ringmaster’s face, the sound of skin tearing followed by the man’s cries satisfied Pernicious’ appetite for vengeance. The man fell to the ground covering his face, the bells on Pernicious’ shoes jingled approaching the now bloody faced man. He lifted the whip and struck it down across the ringmaster’s back ripping his shirt open. Pernicious watched with glee while the man’s skin began to split open and blood slowly seeped out. He looked back towards his companion and lifted his scarred left hand. He pointed towards the back of the tent and mimicked clawing and biting to which the bear roared, pulling on the spiked chain around her neck. Pernicious frowned at the bear and mimed rubbing away tears. Calypso stormed off in a rage to the back of the tent while Pernicious turned his attention back onto the ringmaster. “Please, clown,” he begged with blood spluttering from his mouth. Pernicious cracked the whip and laughed causing the man to cower once again. Pernicious danced from side to side, the man kneeled in horror, awaiting his fate. Pernicious threw the whip down and walked up to the ringmaster. He grabbed him by the throat and lifted him to his height. “Please,” the man begged again; but was interrupted, Pernicious sunk his teeth into his neck, blood squirted out of his jugular vein with Pernicious ripping a chunk of flesh from his neck. Pernicious dropped the man to the floor and sat beside him on his haunches, giggling while he bled out. Pernicious glanced at the man’s neck and noticed one of his teeth sitting in the wound. He laughed and clapped before retrieving his tooth, he pulled out a tiny silver trinket box. He raised his perfectly painted eyebrows, he opened the box to reveal some hair and a few other human remains. He added his tooth to his collection and then turned back to the ringmaster. Pernicious looked at his beautiful head of red hair and became mesmerized. He searched frantically around the area on his hands and knees while he could hear Calypso devouring people in the distance. He giggled once again as ecstasy filled his body, a shiny knife from the knife throwing act lay on the side of the bloody stage. He picked it up and crawled playfully back towards the ringmaster, he thrust the knife into the nape of the now dead ringmaster’s neck, but it became stuck as it penetrated the Occipital bone. The crunching of bone filled Pernicious’ ears, he gave a satisfying moan twisting the knife out and severed the ringmaster’s scalp from his skull. He jumped up, and twirled placing the warm moist scalp onto his head. Blood trickled down his face, he licked his chapped lips and smirked while the last few people ran screaming out of the tent. In the corner of his eye a shadow hid close to the exit. He leaped forward chasing the shadow outside of the tent. In the dimly lit entrance the boy fell face first into the dirt. Pernicious admired the tight young skin on his arms, he imagined what a lovely pair of gloves it would make walking towards the boy. He kicked the boy over onto his back but was startled by how his face was painted. The boy wet his powder blue shorts while Pernicious loomed over him. Pernicious glared at the boy before the child scrambled to his feet and ran. Pernicious moaned but his attention was drawn back to the scream of a woman in the tent that Calypso had trapped in the back, he sniggered running back inside. The boy ran as fast as his skinny, pasty legs could carry him. He made his way to the footpath leading towards the farmhouse, he turned before opening the gate leading into the property. He scanned the field for the clown, but it was nowhere in sight, the cows had all run off down the side of a bank. He clicked open the gate and made his way through, he jumped, startled by the gate shutting behind himfor a moment he paused and stared in the field once again. The flaming red hair of Pernicious’ victim stood out like a beacon, the boy watched Pernicious slowly walk towards the footpath with Calypso not far behind. Pernicious stood still and stared at the boy, he pointed at him and let out a demonic scream, the boy shuddered before watching the clown and the bear seemingly disappear back into the night. The boy turned and looked towards the farmhouse, he could see someone walking past a window upstairs. He ran towards the front door, three carved pumpkins sat on the stone steps, but they all head cheerful faces carved into them. Again, something caught his attention, something ruffling in the bushes on the side of the farm house. His curiosity got the better of him; so, he took a few steps forward in his muddy shoes, he stood before some large conifer trees with shrubbery underneath them, he began to quiver, he could hear something trying to breathe softly. A glimpse at a pair of ochre eyes sent the boy running to the front door; he banged desperately and repeatedly, screaming out feeling something brush against his leg. He fell onto a hallway floor as the door suddenly swung open, a tall blonde woman quickly pulled him in and shut the door. He lay on the carpet while she latched several locks on her door, she turned to help the traumatized boy up. “God’s truth,” she said holding the boy on his trembling shoulders. “Why are you running around Black Mountain at this time night?” she asked the boy whose legs had now become weak with the adrenaline leaving his body. He tried to speak but the words wouldn’t flow. “Especially on Halloween,” she scolded him. “Are you one of the circus children?” she asked looking at his face paint. The woman sighed and led the boy down the passageway into the kitchen. The pipes rattled as she opened the tap filling up a glass with water, he watched her add a few spoons of sugar to it “drink this” she instructed stirring the mixture. “It should calm your nerves,” she assured him. The young boy sipped the water while his eyes wandered around the kitchen. The woman had a beautiful welcoming smile. “You feel any better?” she asked after a few minutes to which the boy nodded. He looked at a collection of spoons in a glass case on one of the stone walls but was too young to understand that she had collected them from all over the world. The boy looked across the large table and noticed a baby chair, “you have a baby?” He asked to which the woman smiled. “Oh, so you can speak,” she teased him to which he smiled. “I have many children,” she answered. “Your hair is short,” he said to which she laughed, “it’s easier to look after.” She explained before looking at the telephone. “Your parents must be worried,” she continued, “do you know their number, so I can call them?” He shook his head, “I snuck out of the house;” he explained, his green eyes began to fill with tears. “I rode my bike to the edge of the fields and went to see the circus.” The woman warmed a facecloth and wiped away his tears, she looked at his innocent face which was now smudged with face paint and her heart just melted away. “What is your name?” she questioned him while she wiped his face clean. “Dante,” he answered. “How old are you?” she asked, “ten” he answered. “A man gave me a ticket for the circus,” he continued, “he climbed out of my wardrobe,” he explained to which the woman smirked. “Out of your wardrobe?” she played along. Dante nodded, “he isn’t normally very nice, but he told me I must go meet the clowns.” The woman had so many things going through her mind at that moment, “did you see the clown?” she asked to which he began to tense up. “I did, but he wasn’t very nice. The man in the cupboard told me the clown knew where my mom was.” He continued. She lay her hand across her chest and picked at the loose thread on her nightgown and she contemplated what to do. “Where is your mom?” She asked curiously. “She disappeared,” he answered with a trembling voice. Sadness riddled his face as his shoulders sunk down. The little boy tensed up instantly with the sound of something breaking upstairs. “Let me go and see what that was,” she told him before leaving the room and walking down the passageway. He looked at the plates neatly put on display up against the wall. They each had a different picture on them, mostly of farmhouses or cottages. He looked towards a dripping tap, he wandered over to it and found a dolls arm laying beside the sink. He could hear the woman scolding someone before she marched downstairs holding a smashed porcelain doll. The woman was red in the face, she breathed heavy before pursing her lips. “I’m afraid my children don’t play well with each other,” she apologized setting the doll carefully on the table. Dante stood by the sink watching the woman talk to the doll. “I will fix you up, don’t worry the pain won’t last long,” she assured the doll. Dante began to feel uncomfortable, he looked out of the kitchen window into the darkness wondering if he should not just run but his train of thought was broken when the woman laughed. “Dante,” she called him, “I want to show you something.” He reluctantly made his way over to the large table where the woman sat, her back towards him. She was whispering before turning and giving him a smile, “I want you to meet Nicky,” putting the porcelain doll on her lap. Dante frowned and looked closer as there seemed to be blood dripping from her smashed arm. He screamed when the doll blinked, he ran towards the front door with the woman following hastily. He couldn’t reach half the locks on the door; he looked back towards the table, the doll began screaming with her Victorian outfit now saturated in blood. The woman tried to grab him, but Dante ran up the stairs, the woman begged him to calm down, “Dante please,” she continued to beg. He found himself standing in front of a long corridor with rooms on either side. He ran to the first door turning the brass knob, he quickly entered slamming the door shut behind him. He felt fervently for the light switch hearing her footsteps approaching. He clicked the switch and locked the door, he cried hearing her calling his name. His attention turned to giggling in the room, he turned to two sets of bunk beds, but no one was in them. For a moment, he forgot where he was and marvelled at all the toys. “Dante;” he heard the woman shouting his name, he cowered beside one of the beds and began dry heaving. The brass door knob began to rattle with her continuously screaming his name, “open this door young man!” She ordered him. Dante cried out as something cold brushed against his leg. He could hear muffled giggles from behind the beds… he peered over the dusty bedspread and whimpered as a myriad of dolls emerged from their hiding place. Their glass eyes glistened while they stared at him, their tiny feet clinking on the wooden floors as they jumped off the bed. Dante stared in horror as a much bigger rag doll emerged from the cupboard. Her buttoned eyes were huge, black, and menacing. Her stitched smile revealed human teeth. Her face grew darker with every step she took towards him, while some giggled while creeping towards him. One of the dolls threw a ball up at the light smashing it out of its socket plunging the room into darkness. Dante tried desperately to open the door. 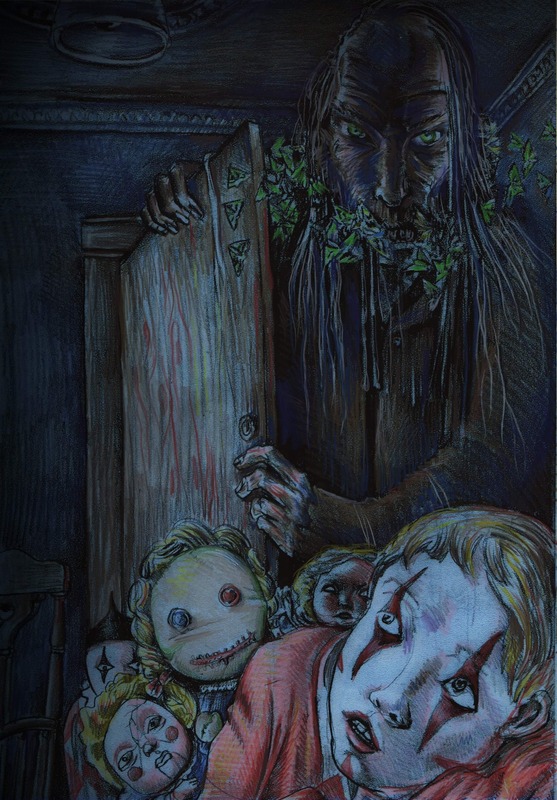 He could feel the dolls sinking their teeth into his legs and arms, sharp little bites like needles pierced his skin. He finally managed to open the door, running into the woman he pushed her off her feet and ran further down the passage. The walls were filled with pictures of her dolls, he looked back to see her fumbling to her feet. He tried every door, but they were all locked; Dante whimpered, the dolls were now in the passageway and turned their attention onto him. He heard a door creak open and looked to his left, he ran towards it quickly entering and shutting it behind him. He frantically searched for the light switch knowing that someone or something had unlocked that door from the inside. He stood still feeling a cold breath hit his neck, goose bumps infested his pale skin. He slowly turned around, he could see nothing in the darkness. He could hear the woman approaching once again with a myriad of pitter patters behind her. In his mind, he knew that his life was over, and he gave up right there and then. The woman flung the door open, light cast onto a towering shadow before it quickly escaped into the darker region of the room. “No point in running Dante!” she scolded him switching the light on. To the side of Dante stood a large Oak wardrobe, he turned to the woman and begged her to let him go. “I can’t,” she explained, her dolls scurried and giggled behind her. “I’ve always wanted to create a doll your size,” she continued with a crazed look on her face. “And now I have the perfect vessel,” she sneered. Both of their attention turned to the sound of something rummaging within the wardrobe, long pale fingers curled around the side of its door as it creaked opened. The dolls scattered, running in all directions, some of them even smashing into each other. The woman was enraged; Dante ran towards the wardrobe, the door burst open flinging him to the floor, he looked up to see the man that gave him the ticket to the circus. The woman looked up to the 8 foot being, his jade eyes peered back at her. “Who are you!” she shouted out as he walked towards her slowly. She could smell the mould and dampness from his moth-eaten cloak, but worse was the foul-smelling liquid he left behind on the floor with every step that he took. “Who are you!” she demanded once again. By this time, Dante had stood up, “please take me home” he begged and that is when the woman remembered him telling her about the man in the wardrobe. “He is mine!” She hissed but the being before her just stood and stared at her. He looked back to Dante, moths flew from his mouth after he let out a howling scream. He turned his attention back towards the woman who was standing her ground, he took another step forward and bent down to stare into her eyes. The skin on his face was so thin he looked skeletal, a white pus dripped from his lips onto her dark wooden floors. Chunks of his silver hair fell to the ground as he turned away from her and began walking towards Dante, the woman looked at the gaping hole in the back of his head, she could see what looked like a piece of his skull and brain. “I won’t let you take him!” She threatened to which he spun around. “He is mine,” he said with several voices speaking simultaneously from his mouth. A single moth escaped his mouth before he turned to Dante and grinned, he grabbed onto his musty wet coat and howled rushing forward at an incredible speed, he grabbed Dante and entered the wardrobe. The last thing the boy heard was the woman screaming in frustration as the wardrobe door shut. “Thank you,” Dante whispered before feeling himself falling downward. Beads of sweat formed on Dante’s face, he jolted out of his bed. He was breathing heavily, shaken, and terrified. He heard someone coming, he needed to hide but it was too late. “You okay?” A familiar voice asked opening his bedroom door, Dante sighed a breath of relief. “I’m fine daddy, I just had a bad dream.” He answered, Dante could not believe how real his dream felt. His father peeped into the room and smiled at his son, Dante pulled the covers up to his chin, “night daddy” he whispered to which his father replied, “night Dante.” closing the door. Dante reach out and switched his carousel light on; his heart began to race noticing all the tiny bite marks on his arm. Dante ripped the covers off the bed, his sheets full of mud from the circus. He looked at the images on the walls cast from the carousel light and felt ill, his little body began to sway while vertigo began to set in with every note from the carousel. His eyes widened hearing the wardrobe door creak open. Long pale fingers wrapped around the side of the door and Dante gave a weak smile, although he feared the man from the wardrobe he couldn’t believe that he had saved him. But as he watched, a second hand grabbed onto the wardrobe door. A maniacal laugh filled the room, Dante could hear a bear growling in the distance. “Daddy!” he screamed out in sheer terror. His father heard his son and shook his head; Dante was acting out since his mother was put away three years prior, she constantly believed something was after her. He looked at her picture next to his bed, he recalled the phone call to tell him that she had gone missing from the facility. The last she was seen was running up into the attic, the orderlies searched that attic and found nothing. Many believed she was never near the attic to start with, the only thing in there was a few dusty wardrobes and old rusty beds.